Park rangers from Lake Mead National Recreation Area stressed life jacket safety to a group of children at the Boulder City Library last week as part of a larger outreach to mitigate accidental youth drownings at Lake Mead. The hourlong “Saved by the Jacket Water Safety Event” all-ages event was led by Michelle Riter, district interpreter at Lake Mead National Recreation Area. To further keep children and adults safe, the National Park Service has installed life jacket loaner stations at Boulder Beach and Cottonwood Cove, which usually have 20 to 30 jackets available at no cost during park hours, according to Christie Vanover, spokeswoman for the recreation area. The expanded mitigation efforts were implemented after the results of a Life Jacket Observation Study found that only 10 percent of adults on the shore were wearing life jackets and only 13 percent of adults on boats were wearing them, Vanover said. The study was conducted last summer by members of University of Nevada, Las Vegas, the Veterans Tribute Career and Technical Institute and the National Park Service. The group surveyed 1,608 people onshore and on boats. The study revealed that more than 90 percent of people were not wearing a life jacket. According to Mary Hinson, the park’s chief ranger, it was discovered through 10 years of research that the main cause of unintentional death was people not wearing life jackets. The statistic led park officials to conduct the study. “We wanted to know who to target with our outreach programs,” Hinson said. The study points to a low level of child and adult wear rates. And a pattern of increasingly lower wear rates when children get into their teen years. The results showed 29 percent of children up to 5 years old onshore wore a life jacket, but children from 13 to 17 onshore wore their life jacket only 7 percent of the time, Hinson said. However, there were some positive results in the study: The highest wear rates were children younger than 13 on boats, and people on personal watercrafts, with a 90 percent wear rate. But Hinson said there is a good reason. “The law mandates that riders under 13 on a boat wear a life jacket, and all riders on personal watercrafts be wearing a life jacket,” Hinson said. The efforts don’t stop at the beach. Riter said that their safety classes at the library follow the summer reading programs. And the Park Service goes to schools in Boulder City and Las Vegas. But Riter said because of budget cuts, the amount of staff at the Park Service was limited, and they couldn’t offer as many classes as they would like. There is a light at the end of the tunnel, though. “We partner with the Coast Guard Auxiliary, (which) offers classes as well,” Riter said. The Coast Guard is not the only one offering classes by the shore. The programs are a little closer to home in the summer with classes at Boulder Beach, Cottonwood Cove and Katherine Landing. The classes can be instructional but also entertaining. “We have a life jacket fashion show when we teach the little kids,” Riter said. How to properly wear a life jacket is one of Riter’s goals of the class. “One life jacket will be too big and flip over their head,” Riter said. And one will be too small, showing the jacket won’t support the weight if it’s not large enough. The message seems to be working. There have been only two drowning deaths this year, none involving children. 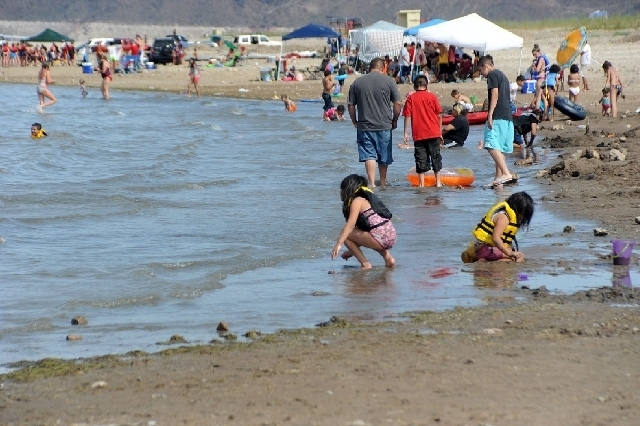 Two children drowned at Lake Mead in 2012. Eight people drowned in the park last year, and 116 have drowned since 2000.